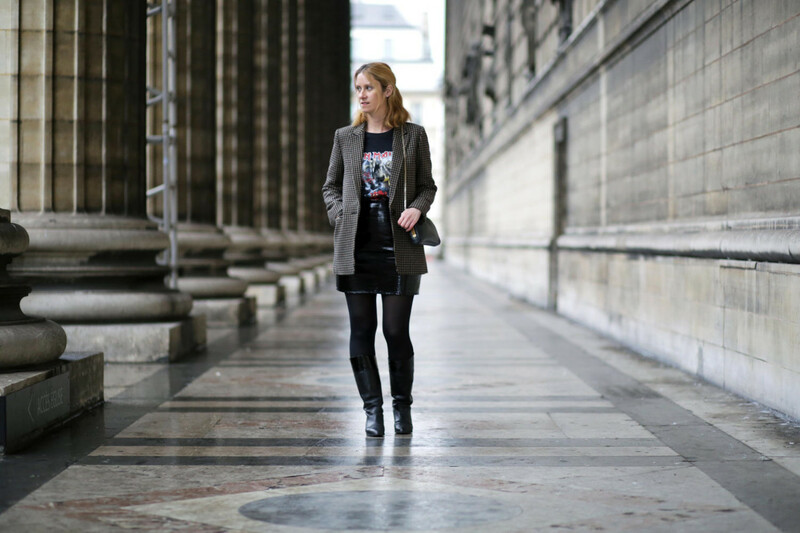 Iron – Blog Mode Tendance et Lifestyle| Paris Beaauuu! This season for the sales I did not spentdall my salary, it’s quite the opposite actually! I bought only 3 pieces. 3 little things including this beige coat found at Mango, a lurex sweater dress that I would soon show you in with a new outfit and this blazer jacket Prince of Wales check purchased from Sandro. To tell you all, I had already spotted this jacket in November but since it was out of the question that I buy it full prize, the idea of ​​this jacket remained in a corner of my head. I even think I had ended by forgetting it a little. It was only by passing by the Sandro stand of the BHV where I originally came to see lights and wallpaper for my apartment’s renovation, that I crushed on this jacket super well cut and with good quality. I had never bought Sandro * and well I think this jacket will go into the history of my dressing! The question is: How to wear this jacket prince of wales check without doing “grandma”? The goal is to play with contrasts! Take a leather skirt, mini vinyl like me or matt leather, a vintage rock t-shirt with Iron Maiden, The Stones, Gun’s and Rose’s or Metallica logo and you’re there. For shoes, as it was raining the day I made the photos, I opted for a pair of boots but honestly you can wear both Doc Martens, small pumps and I would say even a pair of Adidas gazelle would be top for a cool look. Even if I like their collection, I’m not a fan of the brands Sandro, Maje, Zadig & Voltaire and co … Indeed, I do not like the concept of making in a quality worthy of a Zara and sell that at prices that I find scandalously high, all while making margins of insanity! That’s it! That said, there are still some pieces of good quality, you just need to know how to spot them, read labels well and wait for sales.